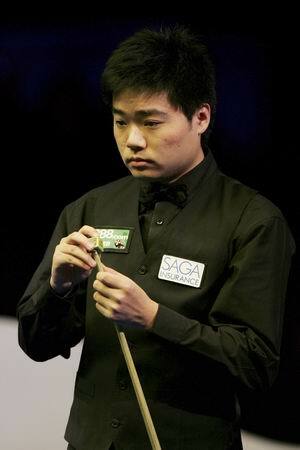 Chinese ace Ding Junhui made sure this year's SAGA Insurance Masters started in sparkling fashion Sunday with the first maximum 147 break seen at the Wembley Arena in 23 years. It was only the second maximum clearance in Masters history, with Kirk Stevens the last player to have achieved the difficult feat 23 years ago. Back in 1984, Stevens made a 147 break in a 6-4 Masters semi-final defeat against Jimmy White at the Wembley Exhibition and Conference Centre. 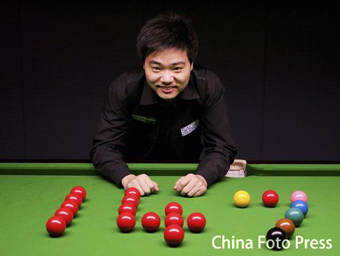 But aged 19 years and nine months, Junhui rewrote the record books again to become the youngster player to have ever made a televised maximum. He also pocketed ?35,000 in prize money, unless the break is matched by another player at this year's event, which concludes next Sunday. He stands to win ?10,000 for the highest break prize and ?25,000 for the maximum break prize. Two-time world champion Ronnie O'Sullivan held the record at 22 years and five months, as the youngster player to have netted a televised 147 when he did so in the 1997 World Championship at Sheffield's Crucible Theatre. Three-times a ranking event winner, Shanghai's Junhui, who practises at the World Snooker Academy in Sheffield, compiled two further centuries in a comfortable 6-3 first round win over Nottingham's Anthony Hamilton and now meets good friend Peter Ebdon - last month's Maplin UK Championship winner - in the next round on Tuesday night. 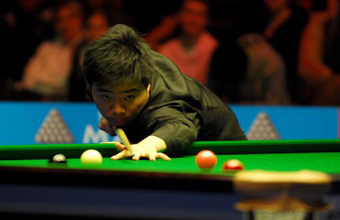 A delighted Ding said: 'I'm feeling really special to be the second player in Masters history to make a 147 break. Looking ahead to his second round match with Ebdon, who beat him 9-5 in the UK quarter-finals, Junhui added: 'I hope we will give the audience a very good game. 'I think I have a good chance and I will be trying my best. It was Hamilton who started the better of the two players with a 59 break to take the opening frame of the pair's best-of-11 frame match. But Junhui hit back with runs of 50 and 61 to level matters. He won the next frame with a 78 break and then edged a scrappy fourth for a 3-1 interval advantage. Hamilton responded following the resumption with a 72 run, before Junhui showed his class. A 105 break made it 4-2, before his special maximum - which came in little over 14 minutes - made it 5-2 and one frame away from victory. Hamilton, a beaten semi-finalist at last season's Welsh Open, pocketed a 103 run to reduce his arrears. But it only delayed the inevitable as Junhui, with a break of 108, made sure there were four centuries in consecutive frames for a place in the next round of this year's ?432,000 event.